JAINA Newsletter: Jain Muni Tarun Sagar passed away, Jain Festival - Paryushan/Das Lakshan, etc. I am deeply saddened to know that Jain Community lost a divine soul - Tarun Sagarji Maharaj on Saturday, September 1, 2018. On behalf of JAINA, I express my sincere condolences to his devotees and pray for his soul to rest in peace. I wish you and your family sukh-sata during upcoming Paryushan and Das Lakshan Parv with each of us getting involved in prayers, fasting and cleansing our souls. Links for English Pratikaman is provided below. JAINA will recognise Tapasvis during Paryushan and Das Lakshan Parva in eNewsletter and at www.jaina.org. International School For Jain Studies has announced ten days winter program in Ahmedabad from December 28, 2018 to January 7, 2019. The program is on "Jain philosophy and way of life and its relevance" More details are given below. As gold does not cease to be gold even if it is heated in the fire; an enlightened man does not cease to be enlightened on being tortured by the effects of karma. Q 1: Name the External Tapasyas (Austerity)? Q 2: Name the Internal Tapasyas (Austerity)? Jain Muni Tarun Sagarji left for the devlok on Saturday, September 1, 2018 after a prolonged illness. The 51-year-old monk, who was suffering from jaundice and other ailments, died at around 3 am. Tarun Sagarji had a massive following in the Jain community and was most popular for his lecture series called "Kadve Pravachan", critical of common practices and views. JAINA expresses the deepest condolences to Jain community and pray for his soul to rest in peace. It's time to show the strength of our community! A donor has given a Challenge for Jivdaya fundraising to JAINA community. For every $1 donation, he will match $4, up to $25,000 donation from JAINA community. Their donation of $100,000 will go to a Chhaperyali Panjrapole near Palitana. Your generous donation of $1 will become $5 for Jivdaya. Please send your tax-deductible (USA) donation as soon as possible to JAINA - Jivadaya Fund, 5308 E. 80th Place, Tulsa, OK 74136 for this worthy cause. If you have any questions, please contact at jainajivdaya@gmail.com. The word “Parva” means auspicious day. The real purpose of the Paryushan/Das Lakshan is to purify our soul by staying closer to our own soul, to look at our own faults, to ask for forgiveness for the mistakes we have committed, and take vows to minimize our faults. We try to forget about the needs of our body (like food) and our business so that we can concentrate on our-self. To ask for forgiveness is the toughest thing to do. Therefore, our great acharyas have said: “Kshama Viram Bhushanam, Kshamavani Michchhami Dukkadam” - To ask for forgiveness is a great quality of the brave ones and if I have committed any mistake, knowingly or unknowingly, I ask for your forgiveness. Mitti Me Savva bhuesu, Veram majjham na Kenai. Meaning: I forgive all the living beings of the universe, and may all the living-beings forgive me for my faults. I do not have any animosity towards anybody, and I have friendship for all the living beings. The process of shedding our karmas really begins by asking for forgiveness with true feelings, and to take some vows not repeating mistakes. The quality of the forgiveness requires humility (vinay - absence of ego) and suppression of anger. Paryushana and Das Lakshan Parva are just around the corner. As you may know, the Jain Centers of Los Angeles and Houston do not allow dairy in the temple due to the incredible suffering animals go through in order to produce milk and its by-products. Unfortunately, many Jain centers today still use dairy products (whether it is ghee in pooja or food served). In our private homes, we must respect a person’s wish to do as he/she pleases. JAINA will recognise Tapasvis by publishing their name and City in eNewsletter and www.jaina.org. Please email your Full Name, Adult/Youth, City and Number of Upvas at jainahq@jaina.org by September 26, 2018.
International School For Jain Studies (ISJS) has announced a ten days winter program in Ahmedabad from December 28, 2018 to January 7, 2019. The program is “Jain philosophy and way of life and its relevance.” The program includes two days pilgrimage to famous Palitana hills and other Jain temples in and around Ahmedabad. The program is free for selected candidates (Who successfully complete the program) affiliated with universities abroad/ India or professional Jains. Please visit www.isjs.in to apply online. The second annual YJP Conference will be held on October 5 to 7 in New York City – a weekend envisioned to help Jains realize their leadership potential, create long-lasting friendships, and facilitate meaningful conversations (not to mention delicious Jain/Vegan-friendly food). 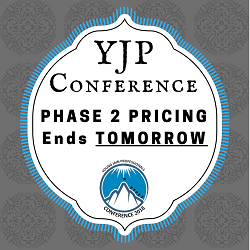 Phase 2 pricing for the 2018 YJP Conference ends tomorrow. Register today at bit.ly/YJP2018Conference to secure early-bird pricing! Prices will go up September 1.